Hi everyone (I think there's like 3 of you, maybe 5 on a good day). I just wanted to give you a quick heads up that blog posts will be scarce or none for the next couple of weeks. It's not that I don't have anything to share with you (believe me, there is plenty), I'm just not going to have time to blog from work or after work. I'm pretty sure that after hours, I'll either be doing more work or so exhausted that I'm just a breathing heap on the couch. Until things calm down, I bid you adieu. at the top of the Space Needle. Note to self: wear makeup. 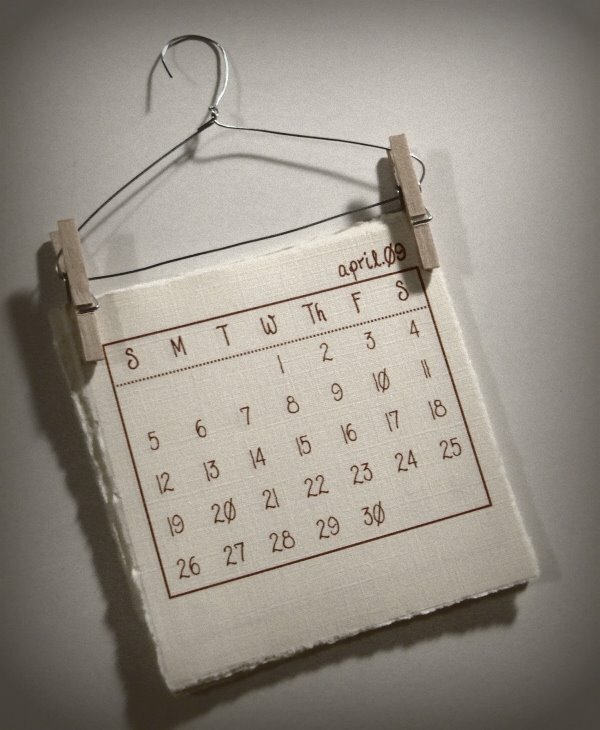 Mini 'laundry' calendar by c(oi)n: purse, aka. Mrs Green Tea. I just spent the last hour making a template for 2012 thinking they'd be a great addition to our OOT packages. But now I'm thinking 'laundry' doesn't match with our theme. I'll see if I can come up with something like a magnet to hide the hook. The trouble with having a long engagement is that you start changing your mind about decisions you've already made, at least that's what all the blogs I've read say. I thought "that won't be me." I'm eating my words now. Kate Spade: Fling in black velvet. ﻿﻿I want these on my feet NOW. They're a touch spendy, but I did find a 10% off coupon. Who am I kidding, they're still over a hundred dollars after discount. *SIGH* I might have to get these just because I need black flats. Ramen anyone? The other night, I just happened to look through the latest Anthropologie circular when my heart skipped a beat. Ribbon Swell Pumps, Anthropologie. How awesome are the little bow details? The red heels I already have were cheap enough that I can justify a replacement pair. But there is no way that I can even begin to justify these, especially since I own Louboutin's. How much, you ask? $400. Yea, you can pick your jaw off the keyboard now. Unless these go on MASSIVE sale and in my size, it's not happening. I keep telling myself that they're too vintage looking. We're not having a vintage wedding (or anything close to it for that matter), so I don't need them. Maybe I'll wear my Loubs with the white dress and the flats with the red dress; the bows are similar! What do you think? I'd love to hear your thoughts on this. (Yes, I realize there are more pressing things in this world, like starving children in China). P.S. Yes, I apparently have a thing for bows this year. Let me preface this by saying that I'm not a real girl. Sure I have a closet full of shoes, but that's about as girly as I get. Makeup, hair, handbags, clothes. While I like looking at it, I don't own a lot of it. I also dislike having to put makeup on my face, do my hair, or put together an outfit. It's a lot of work! Seriously, it is a project to get me out the door for a function. Thank god I work in an engineering environment that allows me to wear sneakers, jeans, a sweatshirt, and doesn't allow me to wear makeup. I follow a lot of blogs. One that I can't seem to pry myself away from is Weddingbee. Brides from all walks of life share their skills. One in particular, Miss Rainbow, is a makeup artist (MUA) shared some incredible beauty and money saving tips that you can find here. I followed her directions, purchased almost the same items (I use Dove Deep moisturizer with SPF15, Make Up Forever (MUFE) HD Invisible Cover Foundation, Sonia Kashuk skunk brush). My face, while looking very natural, was pretty flawless. Can I tell you about the finishing powder? It is AMAZING at setting your makeup. In the past, my eye shadow and eye liner have always, always bleed into the crease of my lid. But after applying a light dusting of the silica powder, it didn't move. Not. One. Bit. Not the best pictures to show you my makeup, but you get the idea. My only failing point is my lip gloss. I knew better than to apply gloss (since I was going with anti-shine), but I completely forgot to grab lipstick on my way out (not to mention, I hate lipstick). Not only was it shiny, it was really bright. OOPS! photo credit: mkchow, friend of the bride and groom. Bridesmiad love (we're missing the maid of honor). Both girls also DIY'd their makeup. I have to tell you a funny story. Well, it's only funny now, it wasn't funny to the bride the day of her wedding. The bride had her makeup done "professionally". Her ceremony started at 11:30am. By the time formal pictures were all done after the ceremony (approximately 1pm), her makeup had run. Her false eyelashes needed to be glued back on, her eye shadow needed reapplying, as did the "waterproof" eyeliner. I was going to attempt to fix her once we purchased some eyelash glue. But we decided to run to the mall and have someone at Sephora help out. Best decision ever made. We walked through the mall and into the Sephora. I asked if someone could help my bride with an emergency makeup fix. At first we were told that they couldn't help, but then a MUA appeared and basically redid her entire face. The running joke was that MUA fixed her face and moved her nose. Sephora came to the rescue, our bride looked even more amazing than before. And all just in time for the wedding party photos to begin. It was an adventure that we will never forget. In addition to DIY makeup, I also DIY'd my hair and my nails. I don't have any pictures to show, but I learned three things. 1) Thermal setting spray makes my hair nappy. 2) I need to invest in hairspray. I shoulda skipped the setting spray, put my hair in rollers, styled it and then sprayed it with hairspray. 3) DIY french manicures are harder and take longer than you think. Oh and no one notices them at all. For the next event, I need to remember to K-I-S-S. Keep It Simple, Stupid! This is the first wedding of the season that I didn't bring my camera too. Maybe it had something to do with the lack or sleep or the fact that I was in the wedding. Have no fear, I have borrowed the pro pictures the photog posted on her blog. There are actually a couple of fun stories and learning to share, but I'm too tired for words, so maybe in a future post. Only pictures for now. All photos by Jules Ko Photography. See them bouqets? I made them! The boutineires were all made by the bridal party along with help from significant others and the brides cousin. I talked about the trial run here. I'll come back to them in another post. Aboard! Next stop: Rochester, NY (yes, this path stops there a second time). This is a very photo heavy post. I tried to condense everything into a collage. First up are the pictures from the wedding, because inquiring minds want to know! The red cloth pictured below is a traditional Chinese guestbook. Everyone signs the fabric (usually silk) and the couple displays it in their home. Personal photos. Click for full size image. Since the wedding was in California over Labor Day weekend, we were able to take advantage of the long weekend and see a few sites. This second collage is of random photos taken around the area; mostly of the mountain range, because I miss being surrounded by LARGE mountians. And of course, I had to swing by the Rose Bowl just to check things out. Unfortunately, it was locked down tight and my dreams of walking onto the turf were shattered. Personal photos - views from the hotel (The Westin Pasadena), Rose Bowl, randoms. Over the years, we've made it part of our trips to stop by the local zoo (only if it's a good zoo). You see, Jake LOVES animals. I read up on this, it's an only child thing. LA Zoo - personal photos. ﻿﻿﻿Lastly, the day of the wedding, we decided to hit up gardens at The Hungtington Library. What a gorgeous and sprawling place. We wandered though the desert garden, the jungle garden, as well as both the Japanese and Chinese gardens. I think we also walked though the lily pad pond and Australian garden. If only we had more time and it wasn't so damned hot. We called it quits before hitting the rose garden. We though "we've seen the Portland International Rose Garden and the one in Boston, we won't miss much." Later we found out we were wrong. I suppose it just gives us a reason to go back. The Hungtington Bontanical Gardens - personal photos. I had grand ideas on how I was going to recap all the weddings. But reality has set in. I'm too far behind, and as we all know, pictures tell the story. The views from the ceremony site completely took my breath away. I still can't get over how beautiful the grounds were, seriously pituresque. It was great to see the EMC crew together. The last time we were all in the same room was for a baby shower, well over a year ago. Speaking of which, said baby (err, toddler) almost stole the show (pictured above). Back in July, I celebrated with N at her bachelorette party. I'm not going to spill any details, but rest assured it was a great time had by all. I do want to share a new learning. I learned how to wear my heels all night long with ZERO blisters! Let me introduce you to my new best friend; anti-chafing block. It's like a wax that you rub on to your feed (or anywhere else). If you read the ingredients, you'll realize that it is basically vegetable oil in solid form. This will work for any shoes, not just heels. I wore my 3 inch heels all night long and no complaints. Photos: Hungce (aka me). I should start using my logo again. That's right, I won a necklace! I follow a relatively new blog called Beantown Bride. This blog is geared to local Boston brides (and grooms) as well as local wedding vendors. They showcase local businesses, tips for wedding planning, and real weddings. Every couple of weeks they will post a new giveaway. They have had photography sessions, gift cards, beauty, and accessory prizes. "I have a large ceylon sapphire ring that was given to me by my grandmother on my 16th birthday. My grandfather was a American businessman in the Phillipines when the Japanese invaded the Philippines in 1942. He had purchased the raw stone during his travels and had it on his person when he was captured and interred. He spent 38 months in a Japanese prison camp and hid the stone (which would be considered contraband) from his captors, moving it daily while he struggled to survive. He met my grandmother upon his return to the US when he was released, and had the stone cut and set into a lovely gold ring with a leaf pattern that he designed himself, and proposed to her with it 12 weeks after they met. They were married 50 years. I always coveted that ring, and she chose me of her 7 granddaughters to pass it to the next generation." "My most prized piece of jewelery is a necklace I've had since I was 9. I visited China for the first time in my life at the age of 9. During my visit, one of my aunties gave me a jade pendant. It is in the shape of a turtle, but looks like an apple or a heart depending on how it's turned. My parents purchased a gold chain to go with the necklace on the same trip. I wore that necklace every day, for the 10 years, until the dainty clasp almost broke. 14 years after the our first trip, we took our second family trip to China. I took the necklace back with me and had a jewlery fix the clasp. It is good as new, but resides in a box. I hope to pass it to my future children." I've had a couple of friends comment that winning must be an omen and a sign for our marriage. I don't know about that, but I do know about free stuff.